When you hear the word "brand" everyone immediately thinks "logo", but that is a very, very small part of your brand. Humor Your Brand to Life! When you hear the word “brand” everyone immediately thinks “logo”, but that is a very, very small part of your brand. Jim Henson, the creator of the Muppets, was a master brander. 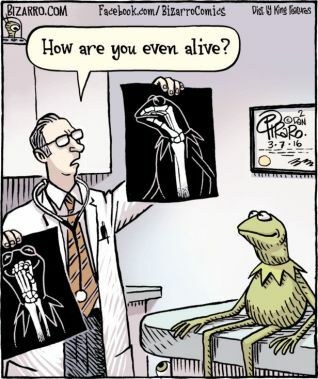 Even though we all know that Muppets are created and operated by human beings — Kermit the Frog, Miss Piggy and the rest of the gang have become our friends. And like all good friends, we listen to their stories and enjoy their company. Your brand is a living, breathing entity that needs to evolve as your business grows. It is not only a look, but the feeling that is invoked when a person thinks about your company — happy, confident, safe, adventurous, etc. It is imperative that those feelings are reignited each time your customer thinks of you, your services or product. A sure fire way to implant a brand is the use of humor. Folks remember funny and will repeat it to their friends — thus growing your brand. It is important that the humor is tasteful and that your typical customer can and will relate to it. Growing up in the South, I learned very young the value of a good story, how it can travel, and how it travels further and longer when a chuckle can be had by all those involved in its journey. So, tell your story, add some funny parts, and watch folks smile when ordering more of your brand! To make one pound of honey, the bees in the colony must visit 2 million flowers, fly over 55,000 miles, and will be the lifetime work of approximately 768 bees.